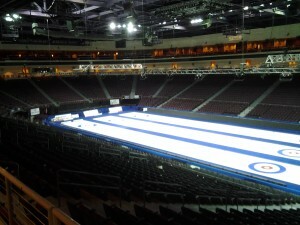 This past weekend at the Orleans Arena in Las Vegas, Nevada, curlers from around the world competed in the Continental Cup. Four Canadian teams and two American teams made up Team North America while Team World consisted of teams representing Norway, Sweden, China, Japan, Switzerland, and Scotland. In one of the most exciting finishes in the event’s history, Team North America won, clinching the victory during the final end of the final game. Last year, we did an episode on curling in Canada and how the sport has achieved its status as part of Canadian society and culture. In this episode of the History Slam, we follow up on that episode by exploring curling’s international presence and some of the key issues facing the sport. To do so, I traveled to Las Vegas and had the opportunity to talk to some of the players about representing their countries, the addition of mixed doubles to the Olympics, and the regulation of new technology and sweeping methods.